Italy’s earthquake death toll has risen to at least 120, PM Matteo Renzi has said. 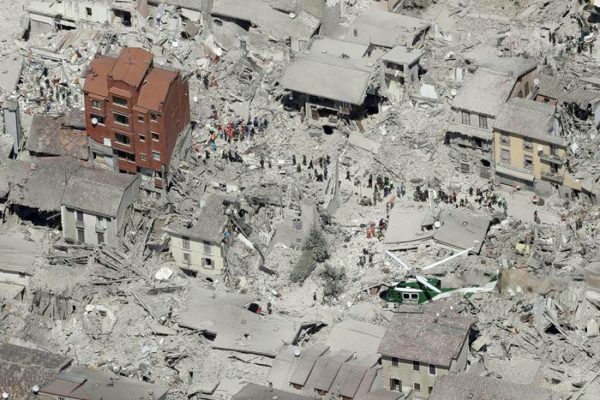 Other 368 people have been injured in the earthquake that hit a mountainous area of central Italy, he added. The 6.2-magnitude quake struck at 03:36 local time, 65 miles north-east of Rome, not far from Perugia. Many of the dead were in the historic town of Amatrice, where the mayor said three-quarters of the town was destroyed, and in nearby Accumoli. Many people are still believed to be buried under rubble. “This is not a final toll,” Matteo Renzi warned as he gave the latest figures. The prime minister had earlier paid tribute to the volunteers and civil defense officials who had rushed to the scene in the middle of the night and used their bare hands to dig for survivors. He promised “no family, no city, no hamlet will be left behind”. The earthquake was felt across Italy, from Bologna in the north to Naples in the south. There have been dozens of aftershocks. Hardest hit were the small towns and villages in the mountainous area where the regions of Umbria, Lazio and Le Marche meet. Italy’s civil protection department said that at least 73 people were now known to have been killed. The National Institute of Geophysics and Volcanology said it had recorded more than 200 aftershocks by 15:00 on August 24. Italy is no stranger to earthquakes: in 2009 a tremor killed more than 300 people in L’Aquila and in May 2012 two tremors nine days apart killed more than 20 people in the northern Emilia Romagna region. Rescue teams from around the country have been sent to the affected region. The area is mountainous and access is difficult. Tent camps are being set up for those who need shelter, while others will be accommodated in buildings such as gymnasiums. Many of the people affected are on holiday. Mediterranean seismicity is driven by the great collision between the African and Eurasian tectonic plates; but when it comes down to the specifics of this latest quake, the details are far more complicated. The Tyrrhenian Basin, or Sea, which lies to the west of Italy, between the mainland and Sardinia/Corsica, is slowly opening up. Scientists say this is contributing to extension, or “pull-apart”, along the Apennines. This stress is compounded by movement in the east, in the Adriatic. The result is a major fault system that runs the length of the mountain range with a series of smaller faults that fan off to the sides. The foundations of cities like Perugia and L’Aquila stand on top of it all.